If you serve beer from both a Sankey D system and a homebrew keg, such as a Cornelius keg, this product will allow you to easily switch between the two. Since this product features uni-body posts, you won't need to worry about losing small parts or assembly. This kit features a ball-lock post for both the gas and liquid sides of a Sankey D keg coupler. Each post threads onto the standard US 7/8-inch x 14 female straight pipe thread draft fittings of your coupler. All you’ll need to do is attach ball-lock disconnects to your beer and air lines and then screw these conversion plugs onto your coupler. Once that’s done, you’ll be able to quickly and efficiently change out your kegs to enjoy both mass-produced commercial beer and your own homebrew creations. Unibody design eliminates complicated assembly and lost parts. much better than previous version. easier to attach to coupler and also fit all my disconnects. I guess better tolerances in manufacturing. also easier to distinguish between liquid and gas. Absolutely the best thing to have when you enjoy both homebrew and commercial beer !!! This is just what I needed! A word of caution however. Do not over tighten. There is a rubber washer inside that got twisted up when I first put the adapter on. It is a real rubber washer, not some cheap piece of plastic, so it grips a little too much. I resolved the problem by popping the washer out and putting a little keg lube on it. Now it tightens up easily and seals perfectly. If you are using this adapter you probably have keg lube on hand anyway. Great product, great idea, but the gasket will buckle and cause a leak if you aren’t careful tightening them. I wanted the flexiblity of using commercial and cornelius kegs without any major reworking of my system. Bought a new kegerator and have used this conversion kit before. 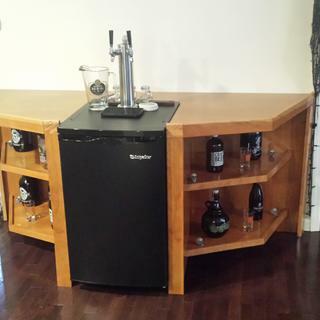 great idea to allow for use of corny keg and commercial kegs! Makes switching from commercial kegs to homebrew corny kegs very convenient. To convert my commercial keg system to accept homebrew kegs. With this kit, I avoid the hassle with re-configuring my kegerator for commercial keg couplers. Now, I can use the ball lock connectors for any keg whether coupler or ball lock posts. Is there a lower profile version? When I attached the adapter to the top sankey post, and the ball lock to the Adapter, it is about a quarter inch too tall for my Danby kegerator. I really hoped this would make switching back and forth from sankey to ball lock easy. BEST ANSWER: Hi Timothy, we don't have a low-profile version of these adapters. However, a keg elbow will help with the clearance issue you're having. A low profile Sankey coupler is an option, but can't be used with the adapters, so it wouldn't help make it easier to switch kegs. Cheers! Timothy, I ran into the same problem with my Avanti kegerator. Rest assured, there is a solution. It's an easy fix. You will actually need a reduced profile coupler which is in fact sold by KegWorks: Item No. 0055S-1, https://www.kegworks.com/premium-us-sankey-keg-coupler-d-system-short-lever-handle. This D-system Premium US Sankey Keg Coupler has a short lever handle which gives another 1/2 inch of clearance. With that extra clearance, the keg and coupler will fit into the kegerator. The coupler runs for about $35. Also, don't forget to grab extra washers! You'll need those wherever there is metal on metal. when adding the ball lock conversion kit to my Sankey tap, do I need to keep the rubber check valve on the Air side? BEST ANSWER: Hi Kelly, you definitely need to keep the check valve on the coupler. The check valve is essential to keeping beer out of your air line. These adapters just make it easier to switch between keg types. Cheers!